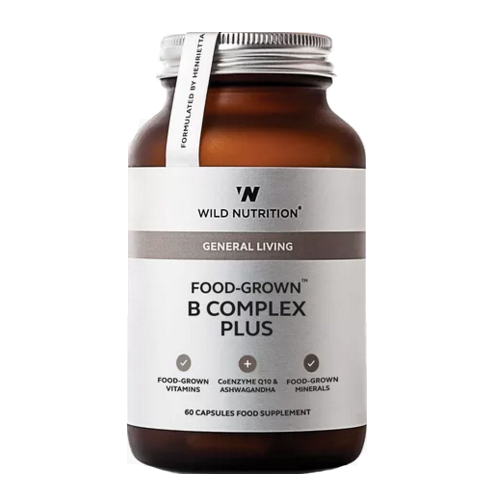 Wild Nutrition’s Food-Grown B Complex Plus is a sophisticated blend of Food-Grown nutrients and botanicals to support energy needs and resistance to stress. During times of stress, the body’s demand for B vitamins and minerals such as magnesium can increase rapidly. Ensuring a sufficient supply of these key nutrients can support the nervous system, immune system and energy factories to ‘weather the storm’ more effectively. This unique complex contains clinically proven nutrients such as vitamin B6 and B12 which contribute to the reduction of tiredness and fatigue, promote normal immune function and mental performance. The addition of vitamin C and magnesium help to support the protection of cells from oxidative stress as well as a healthy nervous system. This comprehensive formula also contains co-enzyme Q10 for supporting energy production and the nervous system, and Wild Nutrition`s hero ingredient ashwagandha, an amazing herb thought to support the nervous system, immune system and adrenals during stress, as well as increasing resistance to ‘burn out’. Vitamin C and Bioflavonoids incorporated in Citrus pulp. Mineral enhanced yeast providing; Riboflavin, Vitamin B6, Vitamin B12, Biotin, Manganese, Inositol, Choline, PABA (Para Amino Benzoic Acid),Pro-natured CoEnzyme Q10. Lactobacillus bulgaricus (from milk) providing Thiamine, Niacin, Pantothenic Acid and Magnesium; Lithothamnion Calcareum providing Calcium; Folic Acid incorporated in Alfalfa concentrate; Organic Ashwagandha powder; Vegetable Cellulose (capsule shell). Below are reviews of Wild Nutrition B Complex Plus - 60 Capsules by bodykind customers. If you have tried this product we'd love to hear what you think so please leave a review.